I always write to music … I may have mentioned that in the past. Is there anything better than music to deliver a mood, carry us to greater heights, help us feel the blessings we’ve been bestowed, and yes, sadly feel the depth of our sorrow? Not in my book, probably why there are few movies without music. I’ve often fantasized about my readers being able to hear the music I write to. And I’m sure it’s probably already in the works, future blogs will come with their own soundtracks, but at the same time, music is personal, so what I feel when I listen to a song may not be what my reader feels. Tonight I wanted to select something that would help me write about the wonder I find on this earth … the Alice in Wonderland kind of wonder because that’s been on my mind lately. I’ve spent some time sifting through my Itunes not really finding the right song, and have finally settled on the soundtrack from Chocolat by Rachel Portman, maybe because I adore most soundtracks as they reach right down into your heartstrings and invite you to offer back your own song, or maybe because the movie Chocolat offers up a supernatural breeze, inviting the viewer ever so slowly to follow along. If you care to join my personal soundtrack, have a listen to Chocolat while you read. These last two weeks I have been ever so cognizant of life’s mysteries, and the fact that the longer I live, the more interesting and magically complicated I find my life. I feel a bit like Alice, that which should be …isn’t … that which shouldn’t be … is. I marvel at my blessings, I mourn my losses, and I quietly dance with the universe to the music of my soul (Caravan on the soundtrack … oh my, great scene in the movie). These last few weeks I have experienced the joy of old connections that might never have been possible had I not stumbled down that rabbit hole, and I’ve fought with the sorrow of losing someone far too early that I felt was a tree that would stand in my wonderland forest for many years. I have danced at the celebration of our children, and cried for the loss of our children. I’ve been turned upside down and inside out for about two weeks, and find myself ready to just lie in the grass for a while and watch the clouds drift by. I reach out to Paul, Taylor and Marisa to join me cloud watching any time waiting for a glimpse of Carrie. She’ll be there, of that I’m sure. Celebrating John and Claire’s wedding, bringing so many of us old friends together along with their children and their children’s children … was truly a blessing. Last week in Tahoe at the cabin, making Minnie’s risotto … I found myself climbing up out of the hole, a bit disoriented as to where I was … wasn’t it just yesterday I sat at her table as a young woman? Aww, but life passes so quickly. Cheers to those who have passed … cheers to us that still inhabit this earth … cheers to making the most of the time we have left, no matter how long that may be … cheers to connections that stand the test of time … and cheers to Minnie’s risotto. A special ps to my sweet man, Rick, I think we should dance in Alice’s Wonderland to Caravan. My love to both you and Rick!!! Thanks Tracy, I always smile to see your response. 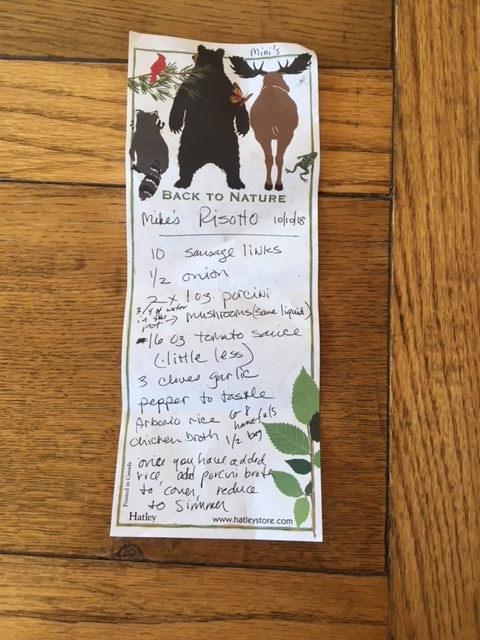 Making Minnie’s risotto in a cabin at Tahoe sounds like the stuff of dreams. I hope you saved me some.